All-new for 2003, the Nissan Murano is a crossover SUV, designed to carry people and cargo like a sport-utility vehicle, but drive and ride smoothly like a car. Available with front- and all-wheel-drive, the 3.5l V6 powered Murano hosts five passengers. 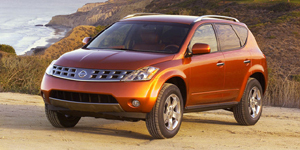 The 2003 Nissan Murano SUV is powered by a 3.5-liter V6 with 245 hp.